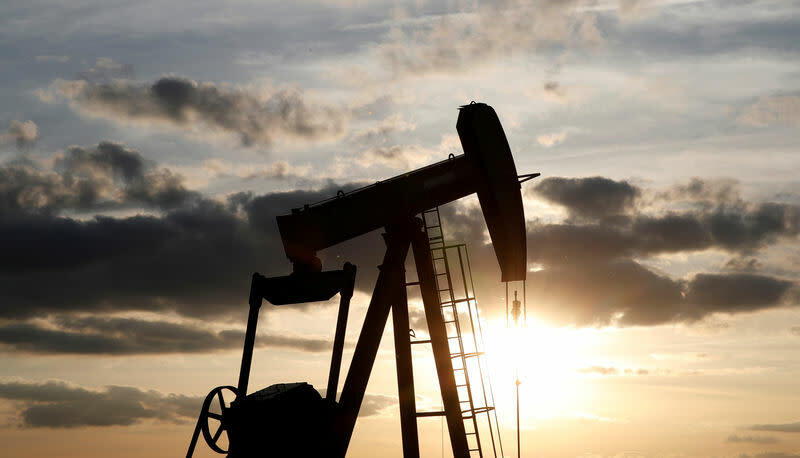 NEW YORK (Reuters) - Oil futures rose on Monday after weeks of declines, as investors grew more concerned about an expected fall in supply from Iran due to U.S. sanctions and worried less that a trade war between the United States and China would hurt economic growth. Brent crude futures (LCOc1) rose 38 cents to settle at $72.21 a barrel, a 0.5 percent gain. U.S. West Texas Intermediate (WTI) crude (CLc1) rose 52 cents, or 0.8 percent, to end at $66.43 a barrel. China and the United States will hold trade talks this month, the two governments said last week, hoping to resolve an escalating tariff war between the world's two largest economies. Still, White House economic adviser Larry Kudlow said Beijing should not underestimate President Donald Trump's resolve. "Part of the weakness we've seen in crude oil has largely been due to trade as people are concerned that increasing tariffs and tensions on trade are going to increase the level of uncertainty and potentially reduce global GDP demand," said Brian Kessens, portfolio manager and managing director at Tortoise. "Anything that reduces those tensions, you can see oil generally move back the other way." Traders said U.S. sanctions against Iran were supporting prices. The U.S. government has introduced financial sanctions against Iran which, from November, will also target the petroleum sector of OPEC's third largest producer. On Monday, Iran asked the European Union to speed up efforts to save a 2015 nuclear deal between Tehran and major powers, which Trump abandoned in May. Most EU companies have pulled out of Iran for fear of U.S. sanctions and Tehran said France's Total had officially exited Iran's South Pars gas project. "The Iranian sanctions will likely remain as a latent bullish force for another month or so until more definition is provided with regard to the impact on the country's oil exports," Jim Ritterbusch, president of Ritterbusch and Associates, said in a note. China signalled it wanted to continue buying large volumes of Iranian oil despite U.S. pressure and was now switching to Iranian tankers to skirt U.S. sanctions on ship insurers. The U.S. Department of Energy (DOE) is offering 11 million barrels of crude for sale from the nation's Strategic Petroleum Reserve (SPR) ahead of the sanctions on Iran. The sale appears to be designed to show the Trump administration is taking measures to restrain energy price increases ahead of the sanctions, one crude trader told Reuters. Elsewhere, Saudi Arabia crude exports rose to 7.240 million barrels per day in June, official data showed.